Acle United Womenarrow-rightCreated with Sketch. Acle United Women suffered their first home league defeat of the season after losing 2-1 to unbeaten Cambridge City on Sunday. The hosts made one change from last week’s victory at Haringey with Shields returning to the starting line-up at the expense of Mugham-Gray who had a place on the bench as Acle kicked off with a stiff breeze at their backs. However, it was the visitors who mounted the first attack, although Shields stopped it in its tracks with a timely intervention. A series of throw-ins by Acle down the right flank saw Birchall cross from the by-line but Brister was unable to get to the ball in time before Cambridge cleared the danger. A foul on Scully saw Larkins free-kick volleyed by Birchall but the Acle striker’s shot was saved and in their next attack, Birchall beat two defenders and had a shot parried by the away keeper before being cleared. Play was end to end and it was City’s turn to attack with a ball over the top of the Acle defence, but Bell was out quickly to smother the ball before being cleared by Parker, then a shot from the right of goal was high over the bar by the visitors. The visitors had a spell forcing Acle back in their own half and thought they had taken the lead on 15 minutes when they forced the ball home in a goalmouth scramble from a corner, but the ball curled behind the goal-line from the set-piece. Cambridge’s pressure finally paid off after a move down the left forced Acle to concede a corner and from the set-piece a looping header beat Bell to give the visitors a 1-0 lead. Straight from the kick-off, Larkins sent a long ball to Todd to chase which was scrambled clear by the City defence, before in their next attack, Birchall was fouled and from Scully’s free-kick, Todd’s effort was saved by the keeper with Brister heading wide the rebound. Ten minutes before the break, the visitors missed a golden chance to double their lead. Acle were penalised for a foul around 30 yards out from goal and from the set-piece, a City player unchallenged headed over from 6 yards. A poor goal-kick from the visitors went straight to Birchall, but as the Acle striker raced towards goal she was pulled back by a City defender earning a booking from the Cambridge player. 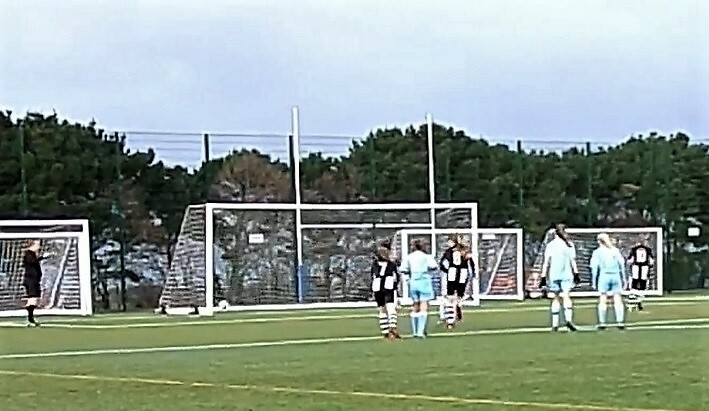 The free-kick being cleared by the away defence. In added time Cambridge doubled their lead when a crossfield ball cleared the Acle defence and Bell was beaten by a shot at her near post as Cambridge went into half-time 2-0 up. Within 2 minutes of the restart, Acle thought they had reduced the deficit. Todd sent in a low hard cross from the by-line which deflected off a defender and appeared to go over the goal-line before being clutched by the keeper, however, the referee from some distance away penalised Acle for a foul on the keeper by Cooper following up to put the ball over the line again. Although Acle were having the better of the play during the early stages of the half, a quick break by City was only halted by a good covering tackle by Parker, before a free-kick by the visitors was volleyed into the side netting at the far post. Midway through the half, the visitors were reduced to 10 players. Larkins was fouled and Birchall walking to the spot where the free-kick was to be taken was kicked at by a Cambridge player right in front of the referee who sent the player off. Now with a player advantage, Acle were showing a lot more urgency in attack and Todd won a corner on the far right. Birchall’s corner was handled by a Cambridge defender and Birchall sent the keeper the wrong way from the penalty to reduce the deficit with 15 minutes remaining. Acle almost equalised shortly afterwards but Cooper sliding in at the far post was just unable to get on the end of Birchall’s low cross, then Cooper saw a shot saved by the keeper at the 2nd attempt. In added time, Bell saved well from a quick break and shot from City as the visitors kept their 100% winning start to the season with the hosts feeling they deserved at least a point from the game. Acle United Women: A Bell, A Larkins, L Goodfield, B Scully, G Parker, C Shields, N Cooper, M Todd, R Brister, G Birchall, L Bullard. Subs used: R Filby, K Pasque. Unused: C Fullbrook, O Mungham-Gray, R Burton.